English journalist; born at London 1815; died at Brighton Oct., 1854. He was the son of an English merchant, and at fifteen years of age made his début as an actor at Covent Garden. Influential friends then placed him at Cambridge, whence he passed to Göttingen University. Phillips then came to London, and in 1841 turned his attention to literature and journalism. His earliest work was a romance entitled "Caleb Stukeley," which appeared in "Blackwood's Magazine" and was reprinted in 1843. Its success led to further contributions to "Blackwood's," including "We Are All Low People There" and other tales. 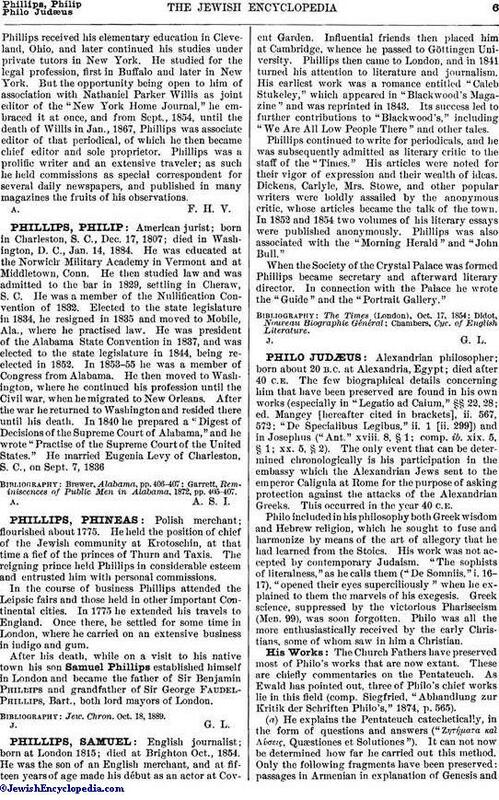 Phillips continued to write for periodicals, and he was subsequently admitted as literary critic to the staff of the "Times." His articles were noted for their vigor of expression and their wealth of ideas. Dickens, Carlyle, Mrs. Stowe, and other popular writers were boldly assailed by the anonymous critic, whose articles became the talk of the town. In 1852 and 1854 two volumes of his literary essays were published anonymously. Phillips was also associated with the "Morning Herald" and "John Bull." When the Society of the Crystal Palace was formed Phillips became secretary and afterward literary director. In connection with the Palace he wrote the "Guide" and the "Portrait Gallery." Chambers, Cyc. of English Literature.